i know, kale. i have to say kale won me over long ago, so i am not a bandwagon fan. the reason it won me over is that it can sit around in the fridge for a few days and still taste great. after all, who likes a soggy salad green? 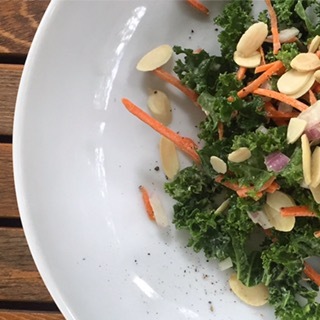 all you really need for this salad is kale & the dressing, the rest is up to you. my go to is shredded carrots, sliced or chopped red onion & smoked almonds. so, here is the life changing salad dressing. note that kale is perfect for kale, it’s thick and can quickly weigh down other greens. * you can partially or completely replace olive oil for lemon juice, i simply like it without.